Would you like to stay in a luxury cabin that provides the absolute most Smoky Mountain solitude near Gatlinburg without also being the absolute middle of nowhere? 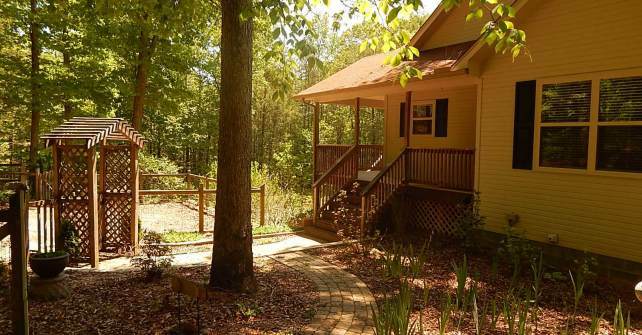 Take a look at Tenn Wood Falls by Cosby Creek Cabins for your upcoming vacation opportunity! This highly private setting takes you away from pretty much all of the main Smoky Mountain traffic without taking away the Smoky Mountain experience and the convenience of getting to Gatlinburg or the Great Smoky Mountains National Park. This cabin is 4 bedrooms large with 2.5 bathrooms and would be most appropriate for a small to mid-sized family or group (maximum occupancy is 8). Looking for a Summer vacation getaway while the kids are out of school? A headquarters to enjoy the Fall Colors the Smokies are famous for? An exquisite house to celebrate Thanksgiving, Christmas, or any religious occasion you’d like? You found it at Tenn Wood Falls. Reserve this cabin at http://cosbycreekcabins.com/2165-2/ or by calling 1-800-508-8844.